Remodeling a kitchen can add to the value of your home and make it easier to sell, especially if the space is populated with aging appliances and old counter-tops. That being said, if you are contemplating a kitchen remodeling project as part of the plan to sell your home, there are also several commonly made mistakes that can turn costly and potentially make your home harder to sell. • Doing an “Architectural Digest” remodel – The value of your home and the return on investment for a high-end remodeling project will be limited by the comparable prices of homes in your neighborhood, also known as “comps”. Before starting a remodeling project, find out where your home currently stands in value versus other comps in the area. The discrepancy in prices can reveal a lot about how much your home will appreciate in value after a remodel; an older home that is deeply discounted from other comps might benefit from the addition of new appliances and other upgrades while one that is priced close to other comps probably won’t appreciate as much from a kitchen project. • Trend-following – The nature of most trends is that they will be replaced by newer trends after a relatively short period of time. While kitchen trends can cover numerous design aspects, they are most commonly related to the selection of specific colors for cabinetry and appliances. Trying to sell a home with a kitchen style that has gone out of fashion can actually make for a tougher sale as the new buyers negotiate with an eye on getting rid of “old” appliances. • Personalizing the kitchen – While you may love a kitchen that looks and feels like diner, not all of your prospective buyers will. Much like going with trendy appliance colors, a “themed” kitchen may not add a lot of value, unless you find home buyers that truly appreciate your vision. 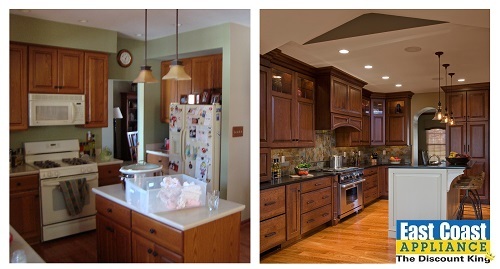 The process of planning a kitchen remodeling project for a home sale is a different than one where owners plan on staying for the long term. For the most cost-efficient remodeling project, new appliances as well as the overall design should stay fairly basic to afford maximal appreciation while appealing to as wide an audience as possible. This entry was posted in Appliances, East Coast Appliance, Kitchen, Refrigerators, Virginia Beach, Whirlpool and tagged builder, contractor, cooking, dishwasher, home, home builder, hrva, microwave, norfolk, oven, refrigerator, remodel, rva, stove, va beach, Virginia Beach. Bookmark the permalink.